After playing Assassin's Creed Syndicate at Gamescom, Phil wondered, "Is invisibility a stealth trick too far?" After playing the same demo at PAX Prime last weekend, I'm asking the same question. Syndicate, on the whole, looks promising. The London setting is a natural fit, contributing tall structures to the map mix. There are some modest improvements over Unity's slightly "out-of-control" combat system. The new Assassin's Gauntlet grappling hook strikes a balance between being a useful escape and traversal tool but not so much so that it's a get-out-of danger button, as I say in the video above. 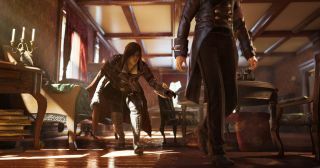 But I wonder whether the ability to turn invisible as Evie (one of Syndicate's two protagonists) practically at the touch of a button will help or hinder a stealthier playstyle. As someone who'd rather see Assassin's Creed become a bit more grounded and martial rather than more supernatural, the mechanic (along with omniscient feats like the Eagle Vision) worries me a bit.